The Salmon as an article of Commerce - Fecundity of the Fish - Mr. Stoddart's Calculations -Dangers of Overfishing - Growth of our Salmon-Fisheries - The Golden Age of the Fisheries - Grilse-Killing - The River Tay: Statistics of its Produce - The English Salmon-Fisheries - Upper and Lower Proprietors. LEAVING the salmon as an object of natural history, I shall now look at it as an article of commerce. The "breeches-pocket" view of the question some years ago became of considerable importance, in consequence of failing supplies; for the commerce carried on in this particular fish is very large; and although our salmon-fisheries are not nearly equal in value to the herring and white fisheries, still the individual salmon is our most tangible fish, and brings to its owner a larger sum of money than any other member of the fish family. Indeed, of late years this "monarch of the brook" has become emphatically the rich man’s fish; its price for table purposes, at certain seasons of the year, being only compatible with a large income; and liberty to ply one’s rod on a salmon river is a privilege paid for at a high figure per annum. Such facts at once elevate Solmo salar to the highest regions of luxury: certainly, salmon can no longer find a place on the tables of the poor; for we shall never again hear of its selling at two-pence per pound weight, or of farm servants bargaining not to be compelled to eat it oftener than twice a week. At every stage of its career the salmon is surrounded by enemies. At the very moment of spawning, the female is watched by a horde of devourers, who instinctively flock to the breeding-grounds in order to feast on the ova. The hungry pike, the lethargic perch, the greedy trout, the very salmon itself, are lying in wait, all agape for the palatable roe, and greedily swallowing whatever quantity the current carries down. Then the waterfowl eagerly pounces on the precious deposit the moment it has been forsaken by the fish; and if it escape being gobbled up by such cormorants, the spawn may be washed away by a flood, or the position of the bed may be altered, and the ova be destroyed perhaps for want of water. As an instance of the loss incidental to salmon-spawning in the natural way, I may just mention that a whitling of about three-quarters of a pound weight has been taken in the Tay with three hundred impregnated salmon ova in its stomach ! If this fish had been allowed to dine and breakfast at this rate during the whole of the spawning season it would have been difficult to estimate the loss our fisheries sustained by his voracity. No sooner do the eggs ripen, and the young fish come to life, than they are exposed, in their defenceless state, to be preyed upon by all the enemies already enumerated ; while as parr they have been taken out of our streams in such quantities as to be available for the purposes of pig-feeding and as manure ! Some economists estimate that only one egg out of every thousand ever becomes a full-grown salmon. 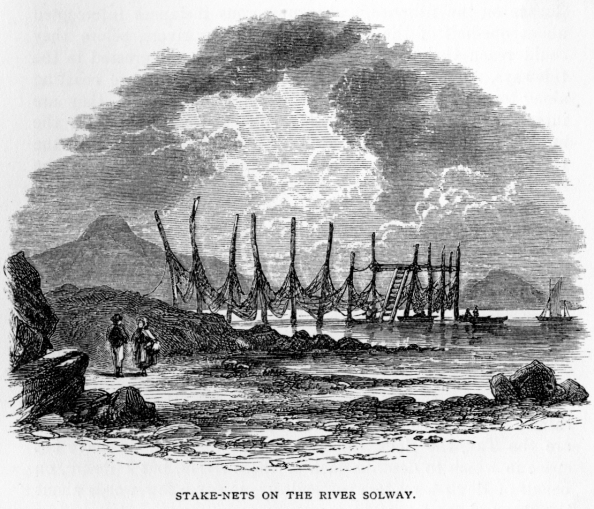 Mr. Thomas Tod Stoddart calculated that one hundred and fifty millions of salmon ova are annually deposited in the river Tay; of which only fifty millions, or one-third, come to life and attain the parr stage, that twenty millions of these parrs in time become smolts, and that their number is ultimately diminished to 100,000 ; of which 70,000 are caught, the other 30,000 being left for breeding purposes. Sir Humphrey Davy calculates that if a salmon produce 17,000 roe, only 800 of these will arrive at maturity. It is well, therefore, that the female fish yields 1000 eggs for each pound of her weight ; for a lesser degree of fecundity, keeping in view the enormous waste of life indicated by these figures, would long since-especially taking into account the destructive modes of fishing that used a few years ago to be in use-have resulted in the utter extinction of this valuable fish. of Perth, and at certain seasons signal or count every fish that passes in the water below him, and every fish passing can be caught by those on the lookout; and I have seen the same watch kept on the Rhine, [The Rhine is an excellent salmon stream, and yields a large number of fish. The five fishing stations at Rotterdam are very productive, each of them yielding about 40,000 salmon per annum ; and it would not be extravagant to estimate the produce of these fisheries as of the value of £25,000 per annum. ] and on other salmon rivers. 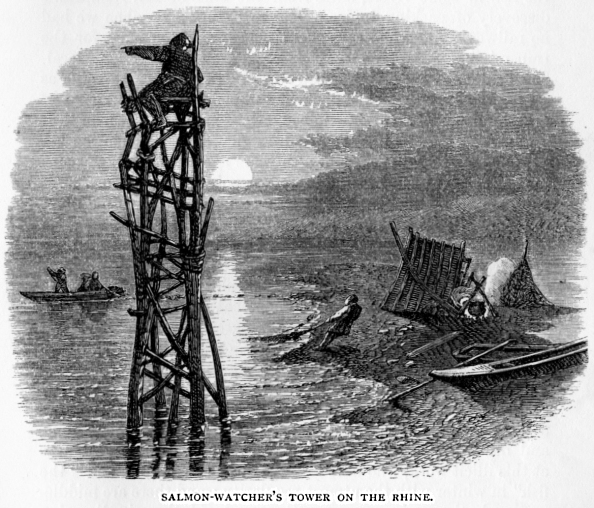 The accompanying sketch of a salmon-watcher's tower on the great German river may interest those of my readers who have never been on that beautiful water. This unhealthy competition will always continue till some new system be adopted, such as converting each river into a joint-stock property, when the united interests of the proprietors, both upper and lower, would be considered. The trade in fresh salmon, which culminated in the almost total extermination of the fish in some rivers, dates from the time of Mr. Dempster's discovery of packing in ice. Half-a-century ago, when we had no railways, and when even fast coaches were too slow for the, transmission of sea-produce, the markets were exceedingly local. Then salmon was so very cheap as to be thought of no value as food, and was only looked upon by the population with an eye of good-humoured toleration-nobody ever expected to hear of it as a luxury at ten shillings a pound weight. No Parisian market existed then for foul fish, and fifty years ago people only poached for amusement. But in the excessive poaching which now goes on during close-time we have a minor cause nearly as productive of evil as the primary and legal one ; for of course it is legal for the tacksman of the station to kill all the fish he can. Add to these causes the extraordinary quantities of infant fish which are annually killed, coupled with that phase of insanity which leads to the capture of grilse (salmon that have never spawned), and we obtain a rough idea of the progress of destruction as it goes on in our salmon rivers. Fifty or sixty years ago men caught a salmon or shot a pheasant for mere sport, or at most for the supply of an individual want. Now poaching is a trade or business entered into as a means of securing a weekly or annual income; it has its complex machinery - its nets, guns, and other implements. There are men who earn large wages at this illicit work, who take to "the birds" in autumn and "the fish" in winter with the utmost regularity; and there are middlemen and others who encourage them and aid them in disposing of the stolen goods. In former times, as at present, there were more ways of killing a salmon than by angling for it. Parties used to be made up for the purpose of "burning the water," a practice which prevailed largely on the Tweed, and which afforded good rough sport. The burning took place a little after sunset, when an old boat was commissioned for the purpose, and flaming torches of pinewood were lighted to lure the fish to their destruction. The leister, a sharp iron fork, was used on these occasions with deadly power ; rude mirth and song were usually the order of the night ; and the practice being illegal was not without a spice of danger, or at least the chance of a ducking. Burning the water, it must, however, be confessed, was more a picturesque way of poaching than a means of adding legitimately to the produce of the fisheries as a branch of commerce. It would have been well for the salmon-fisheries had the arts of poaching never extended beyond the rude practice here alluded to; but now poaching, as I have endeavoured to show, has become a business, and countless thousands of the fish are still swept off the breeding-beds and sold to dealers. Legislation on the salmon question has of late been greatly extended, some powerful Acts of Parliament having been passed for the better regulation of the various British salmon-fisheries, and it is satisfactory to think that much good has been achieved in consequence. It is recorded that at one time great hauls of salmon could be taken either in the rivers of Scotland or Ireland, and that in England salmon were also quite plentiful. One miraculous draught is mentioned as having been taken out of the river Thurso, on which occasion the enormous number of two thousand five hundred fish were captured. The discovery that fish packed in ice would carry a long way without decaying, led, as was to be expected, to so large a trade in fresh salmon between Scotland and England, that it at once effected a great rise in the price of the fish. High prices had their usual consequence with the producer. 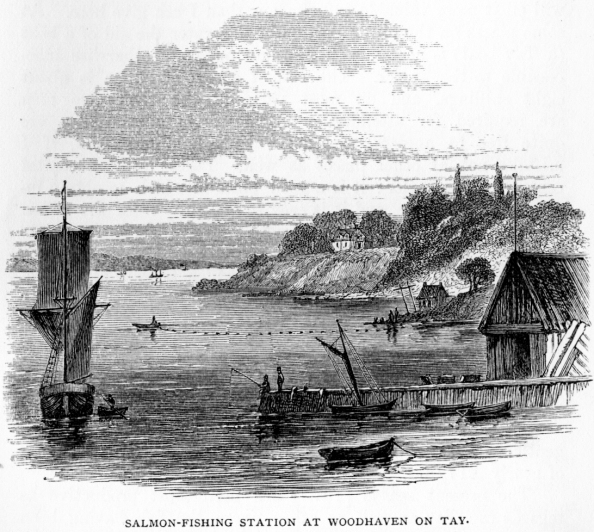 Every device was put in requisition to catch fish for London and the continent; and if this was the case at the beginning, it will be readily understood how rapidly the fish-trade rose in importance as new modes of transit became common At one time there were famous salmon in the Thames, and hopes are entertained of fish being successfully cultivated in that river. It is certain that much deleterious matter has been allowed to get into that stream, and also into that famous salmon river the Severn ; and in the rivers of Cornwall I believe the hope of breeding salmon is faint in consequence of the poisonous matters which flow from the mines. Many rivers which were known to contain salmon in abundance in the golden age of the fisheries are now less prolific, from matter by which they are polluted, such as the refuse of gasworks, paper-mills, etc. Stake and bag nets in Scotland are known to have been very destructive, as have the putchers, butts, and trumpets of the English and Welsh rivers. It would be tedious to describe the different fixed engines invented for the capture of salmon ; what I desire to show is that they injured the fisheries. A striking example of the effect of bag-nets occurred with regard to the Tay. The system having been at one time extended to that river, the productiveness of the upper portions of the stream was very speedily affected; and shortly after their removal, the fisheries became greatly more productive, as will be seen by and by when it becomes necessary to deal with the figures denoting the rental of that river. At the date of the first publication of this work the size and weight of salmon were diminishing, and, as some fishermen thought, their condition and flavour also ; but now there is a change for the better, and our salmon are growing in size again, so that we shall soon find fish as large as those of the olden time, notably the fish mentioned by Yarrell, which was exhibited by Mr. Groves, and weighed eighty-three pounds; or that alluded to by Pennant, which was only ten pounds lighter. It is within the memory of anglers that fish of forty-five pounds weight were by no means rare in the Scottish rivers : that salmon of thirty pounds and thirty-five pounds weight were quite common ; and that the general run of fish were in the aggregate many pounds heavier than those of ten or twelve years ago. Mr. Anderson, the lessee of the best salmonfisheries on the Firth of Forth, a gentleman who is master of his business; is of opinion that the average weight of fish was reduced at the time indicated to about sixteen pounds ; and by the Tweed Tables of the period, the average weight of those killed, though apparently on the increase, in no month exceeded fifteen pounds. I asked, in the first edition of this work, "How is it, then, that we have no giants of the river in these days?" The answer, I think, is simple and convincing. Let us suppose, for example, that the fish grows at the rate of five pounds per annum: it would, therefore, take ten years to achieve a growth of fifty pounds. Now it is needless to say that, in British waters at any rate, we never either see or hear of a fish of that weight. The fact is, we do not give our salmon time to grow to that size. The greater portion of the fish that we kill are two years old, or at the most three-fish running from eight pounds to sixteen pounds in weight. It is clear that, if we go on for a year or two longer at the rate of slaughter we have been indulging of late years, there will speedily not be even a three-year-old fish to pull out of the water. It is very suggestive of the state of the salmon-fisheries that we have now eaten down to our three-year-olds." Happily recent wise legislation on behalf of the fisheries has checked a great number of the evils which prevailed eight or ten years ago; the salmon is again increasing in weight, and the fisheries have once more become comparatively prosperous. A fertile source of salmon destruction is the killing of grilse ; the grilse being a virgin fish, its slaughter is just analogous to the killing of lambs, without due regulation as to quantity. In this respect, " the conduct of salmon proprietors is as rational as high-farming with the help of tile-drains, liquid manure, and steam-power, would be for the purpose of eating corn in the blade." As many as 100,000 grilses have been taken from one river in a year-a notable example of killing the goose for the golden egg. If we had an Act of Parliament to prevent the capture of grilse, we should never want salmon. The parr and smolt are protected. Why? Because they are the young of the salmon. Well, are not grilse the young of the salmon also? Various debates in the House of Commons on the English and Scottish Salmon Fisheries Bills brought out very distinctly the worst phase of the salmon question - viz, the prevalence of stake and bag nets. These machines exercised a baneful influence on the fisheries, and in numerous instances intercepted about one-half of the salmon of particular rivers, before they could reach their own waters. These nets are erected in the tideways, not far from the shore, and as the fish are coasting along towards their own particular spawning-ground, they are intercepted either in the chambers of the bag-net, or in the meshes of the stake-net. It being held that fish taken in the tidal estuaries are in finer condition than those caught in the fresh-water division of the large salmon rivers, they are of course in greater demand, and bring a slightly better price. There is, as we have already noted-but the fact needs iteration -no consideration among tacksmen of river fishings for the preservation of the fish ; it seems to be a rule with these gentlemen to kill all they can. It is obvious that, if the upperwater proprietors were to act in the same spirit, and kill all salmon which reached the breeding-grounds, that fine fish, not unaptly called the "venison of the waters," would very speedily become extinct. As may be known to most of my readers, the chief British salmon streams, so far at least as productiveness is concerned, are the Tay, the Spey, the Tweed, and the Esk. I have not space in which to describe each of these rivers, but I desire, on behalf of English readers particularly, to say a few words about the Tay and the Spey. The Tay is equal to a basin of 2250 square miles, and it discharges, after a run of about 150 miles, a greater volume of water than any other Scottish river. " As ascertained by Dr. Anderson, the quantity which is carried forward per second opposite the city of Perth, averages no less than 3640 cubic feet." The main river and its affluents, and their varied tributaries, afford splendid breeding-ground for salmon. As an instance take the Earn. It flows from Loch Earn in the far west of Perthshire, and is, when it leaves the Lake, a considerable river, and over the greater part of its course its current is very rapid. A slight drawback to its capabilities as a fish-breeding river is the fact of its sometimes overflowing its banks; but its tributaries afford plenty of excellent ground for salmon-breeding. Indeed, in all its tributaries the Tay contains ample accommodation for fish. I have in my mind's eye some excellent salmon-beds near Airlie Castle, on the Isla. The banks of the river are overhung by foliage, and salmon sport industriously in deep pools, resorting to the gravel at the proper season in order to dig beds in which to deposit their eggs, and when in due time these are vivified and grow from the fry to the parr state, I have seen the youthful "natives" catching them in scores. The Tay deserves special honour, for it must rank as the king of Scottish rivers, receiving as it does the tribute of so many streams, and running its course through such a variety of fine scenery. Loch Tay is generally accounted the source of this river, but if it be considered that the loch is chiefly fed by the river Dochart, the source of this latter river is actually the fountain-head of the Tay. The Dochart rises in the extreme west of Perthshire, and, after striking the base of the "mighty Ben More" and the Dochart hills, falls into Loch Tay at the village of Killin, before reaching which place it assumes the dimensions of a considerable river. There is fine angling to be had in the vicinity of Killin; indeed, the salmon rod-fisheries there are of some value, and trout can be taken in great plenty both in the Dochart and the Lochay. Loch Tay contains abundance of fish, and, as that sheet of water is of considerable size, there is ample room to ply the angle, either for salmon, trout, or charr. A few local inquiries as to angling on the Tay will elicit more valuable information than I can give here. At some places on the lower portion of the water the aid of a boat (a Tay boat) is necessary, as the best pools are otherwise inaccessible to the angler. The cost of a boat and man is about eight shillings, and on most parts of the river two men are required for attendance. Some parts of the Tay are quite free to anglers, especially about Kinfauns ; and, if I mistake not, at other places as well. Perth forms a capital centre for the angler: it is a good place in which to obtain information or tackle, and it is easy to get away from the "Fair City" to places and streams of note. And if the angler wants to "harl" the Tay itself, Perth is the very best place to obtain instructions in the art of "harling," which is very attractive. The commercial fishings may be seen in operation at and below Perth : they are carried on by means of the net and coble. A boat sails out with the net, and taking a sweep of the water returns : in its progress enclosing any of the salmon kind that may be in that part of the river. The operation is usually repeated several times each day at every fishing station. The Tay salmon-fisheries are owned by various noblemen, gentlemen, and corporations ; and they yield a gross annual rent of nearly £17,000. The present season  has been most productive as regards the Tay as well as other rivers, the fish having been plentiful, and a fair average price has been obtained for the catch in the wholesale markets. During the first eight days of February-that is, from the 6th, when the first supplies reached the salesmen, to the 15th-the, wholesale price in London averaged 2s. 2d. per lb., but for the next twelve days prices ruled low, lower than is usual in February, ranging from Is. 4d to 1s. per lb. During March the highest price reached was 2s. 1d., and the lowest 1s. 6d., but the average obtained during both months was the same, a fraction over 1s. 9d. per lb. The fish taken in these two months were of a good size, averaging about 20 lb. weight. During April and May the fish did not weigh so heavy, as a run of smaller fish sets in during these months, and, as the season progresses, the quotations, of course, become lower, because in the early part of the year corporation banquets and private dinner parties cause a persistent demand just at the time when, in ordinary places, salmon are least plentiful. This year, however, has been in many respects exceptional, more especially as regards the plentifulness of the supply. In the earlier weeks of the London season fancy prices are obtained by West End fishmongers for their choicest cuts, half a guinea a pound weight having on many occasions been charged. After a little time, when the novelty of a slice of early salmon wears off, and the fish from late rivers, and the famous Scotch grilse, begin to reach the London salesmen, the price falls considerably, if the supply be at all equal to the demand : it would not be safe to name a higher average price than 1s. 3d, per pound weight. It is necessary to be somewhat particular in ascertaining the sales and averaging the price, because it is the only way in which an estimate of the probable number of salmon taken from any particular river can be arrived at. But, even taking the money value of the fish caught as a criterion, an estimate can only at best be a mere guess, although such an estimate is better than none at all, as no reliable statistics of the total number of fish captured in the Tay can be otherwise obtained. It is not the tacksman's interest to proclaim to his neighbours or his landlord the exact value of his particular bit of water ; but, by knowing the rental of a particular fishery and the average price which the fish bring in the wholesale markets, where most of them are sold, a pretty safe conclusion may be arrived at. One other element is necessary to the calculation, and that is the size of the fish. Salmon, it is gratifying to know, may now be taken all over at a heavier weight than they could ten or fifteen years ago. Last year and the year before many very heavy fish were caught in the Tay, some being over 50 lb. weight, and this season also very heavy fish have been obtained. Although a plentiful run of grilse, ranging from 3 lb. to 7 lb. weight, in the course of the summer tends to reduce the average, more especially as about five grilse for each salmon are taken in the course of the year, it may, for the purpose of an estimate, be accepted as a tolerable approximation to the true average of Tay fish as brought to market if they are set down individually at 12 lb. The question to be decided then is this, - Given the rental paid, the price of the fish and their average weight, how many salmon must be captured in order to cover the sum paid to the landlord, as well as the expenses of fishing and a fair profit to the tacksman ? Supposing a particular fishery to be rented at £1000 for the season, it would require the capture of 1334 fish at 15s. each (that is, salmon of 12 lb, at 1s. 3d. per lb.) to pay the rent ; and as it is given out that the expenses of a fishery are equal to the rent, other 1334 fish would require to be taken from the water to reimburse the tenant for his outlay. Then the lessee, or, as lie is called in Scotland, "the tacksman," must have his profit, and that cannot be put at less, estimating that he may have some "pickings" out of the expenses, than an additional 400 fish, or say for each £1000 of rental a total of 3000 salmon, grilse, and sea-trout must annually be taken from the water. Therefore, as the rental of the Tay salmon-fisheries may be set down for the present season as being at least £17,000 (last year  the assessed rental was £16,382:6:4), 51,000 fish will require to be captured to yield the rental demanded by the " salmon lairds," and cover the working expenses and profit of the tacksmen. During some years the lessees will bag, perhaps, twice the number of fish which has been quoted; this season the chances are that all or most of the lessees on the Tay secured in the early part of the year as many fish as paid their rent and other expenses. But in some seasons it requires hard work to make two ends meet, for the fishery is much of a lottery. On some stations large profits are obtained; on others occasional great losses must be endured. Judging of rents and profits on the plan laid down, and going on authentic information of the number of fish taken, the following statement of the Beauly salmon fisheries may prove of interest :-The average rental of these fishings for the seven years from 1863 to 1869 (both inclusive) was £768 : 16 : 9, and the average quantities of fish caught were - 1304 salmon, 4261 grilse, and 350 trout. Taking these at the price arrived at-namely, 1s. 3d. per lb., and allowing, as the grilse are numerous, the average weight of the fish to be 8 lb. each, which is at the rate of 10s. for each fish, the number captured would therefore yield at that price the sum of £2957 : 10s., or a balance over the rent of £2188 : 13 : 3. On the Duke of Sutherland's fisheries, in his own county, and in seven different rivers, the total number of fish captured in 1870 was 19,689 salmon and 29,899 grilse. These figures are quoted to show the value of the salmon as rent-yielding fish. As has already been stated, the rental of the Tay may be set down this season at £17,000. That sum is made up from over 50 different " lets," and these again are divided into many different fishing-stations or "shots." There are, in all, about 267 of these, including 50 bag and stake net stations on the coast district, which extends from Redhead in Forfarshire to Fifeness in Fifeshire. Above Perth bridge there are 45 net and coble stations; on the Earn, a tributary, there are 15, besides two cruives; and from Perth to Newburgh there are no less than 132 shots ; and in the estuary-that is, below the town of Newburgh there are 23. One man, Mr. Speedie of Perth, is lessee of nearly half of the river, judging by the rent he pays, which amounts to about £8000 per annum. The salmon wealth of the river Tay is certainly found between the city of Perth and the town of Newburgh, but no "laird" can say how long such wealth may endure, as floods on the river frequently alter its bed and change the run of the salmon, so that fisheries which 30 or 40 years ago were of considerable value are to-day of no value at all. Others, again, have risen with magic rapidity to be sources of considerable wealth to their owners. Fishings yielding an annual rental of £250, 12 or 15 years ago, do not now let for as many shillings. Such changes have occurred chiefly in the estuary of the river. The chief " salmonmine " of the Tay is called the " throat of the river," a stretch of water about three miles in length, which is very fruitful in fish and yields a heavy rental. It is thought that the breeding operations at Stormontfield have slightly augmented the produce, and, of course, the rental of the river, which about the time they began was at its lowest point, the total rents in 1852 amounting to £7973 : 5s, and in 1853 to £8715:17:6. In the next year they had increased by £500, and by £700 in the following season ; and in 1858, when the young fish were beginning to tell on the supply, the rental had attained the grand total of nearly £11,487 : 2 : 5, being an increase of over £3000 per annum. The economy of a salmon river is as yet but dimly understood. A time must come, however, when the "salmon lairds" will co-operate each with the other, instead of doing as they do at present-namely, compete each against his fellow. The waste of fishing power involved in the maintenance of the number of stations already quoted as belonging to the river Tay is lamentable. If the river were formed into a joint-stock company, the shares being allotted, say, on the average rentals of the last five years, the salmon could be captured and sent to market at about a fifth of the expense which is now incurred. The observance of a proper close time on all salmon streams is of great importance-indeed, the key-note of their prosperity. Most salmon rivers indicate their condition as truly as a thermometer indicates heat or cold ; a change in their economy at once affects the supply of fish, and can at once be detected. A proof of this sensitiveness was afforded by the introduction of bag-nets in the estuary of the Tay. The quantity of salmon taken in the ten years during which the stake-nets existed at Kinfauns fisheries was diminished to 46,663; but after the removal of these nets the quantity increased to 90,101 salmon. The take of grilse diminished and was augmented in similar proportions. The Tay has over and over again afforded a striking example of the effects of mal-economy, and of the good results of wise legislation, conscientiously carried into effect. In the year 1828, at which time the rental of the Tay was above £14,000 a year, an Act of Parliament came into operation which lengthened the fishing season of every salmon river in Scotland, and, as a matter of course, shortened the close season. That Act inflicted great injury on the Tay fisheries. The income derived from the river at that date gradually dwindled down from the sum named to less than half the amount. By a voluntary arrangement, the proprietary, with one or two exceptions, restored in 1852 the status quo, and stopped net fishing on the 26th of August instead of the 14th of September. The fisheries soon began to respond by increased supplies. But this golden age did not last. In three years the agreement was broken through, and the reckless, although perfectly legal, system of fishing was again resumed for a year or two. At length a local Act was obtained, which greatly improved the fisheries and augmented the rents, though, in fact, the extra rest which had been afforded to the fish in the three years during which the voluntary system was in force had already done so much good that the bad system which was again resorted to had not prevented the rental from beginning to rise, as has been already shown in connection with the Stormontfield breeding experiments. It is still thought by one or two of the Tay proprietors that the annual close-time is too long (it extends from August 20 to February 5), and that the net season, in some years, might be advantageously lengthened if a permissive clause were added to the present Act, in order to suit certain contingencies which in some years influence the takes of fish ; but it is perhaps best to leave well alone, especially where the proprietary is numerous, and not likely to be all of one mind on the subject of close time. The Tay is now in a flourishing condition, and so far as can be foreseen at present its salmon-fisheries are likely to go on increasing in value for many years to come, showing that the Acts of Parliament passed during late years have operated beneficially. The Tay is a salmon river par excellence, and the breeding power of the stream is now allowed to be better developed, and the fish have chances of obtaining a longer lease of life than was the case long ago ; consequently salmon have become of more value both in a commercial and sporting sense. Indeed it is obviously better that the spawning "redds" of a river should be occupied by fish yielding 30,000 eggs than by others which would only yield half the number. It is not only the number of fish which are annually caught, but the number which escapes the net and reaches the breeding grounds that renders a salmon stream truly valuable. Nothing is more certain than that if no seed bee sown no harvest can be gathered, and only one salmon egg out of a thousand, it is said, yields a fish for the dinner table. As regards the Tay fisheries, the present season  which has just closed as these sheets go through the press, may be said to have ended in a blaze of triumph. It was signalised by the taking of some very large fish-one of 60 and another of 64 lbs. weight. I measured the 60lb. salmon : in length it was 4 feet 3 inches, and in girth 2 feet 82 inches ; its circumference at the narrowest part of the tail was 112 inches, and the breadth of the fan was 13 inches. I did not see the 64 lb. salmon, nor the fish of 58 lb. that had been taken a few days before at one of Mr. Speedie's shots, but I saw at one time about 300 fish that had been all taken from the Tay, among which were a great number of heavy salmon. A few days before my visit, Mr. Speedie's boats brought to his fish-packing house a haul of over 900 fish ! The river Spey is an excellent salmon-producing stream; in fact, size considered, it is the richest in Scotland, the fishings at Speymouth being worth £12,000 per annum. The Spey runs about a hundred and twenty miles before it falls into the sea, and some parts of the river are very picturesque. Are the bonniest haughs on the run of the Spey. The stream is very rapid, having in its course a fall of twelve hundred feet; it rushes on in one continuous gallop from its mountain well to the sea, giving rise to the local proverb of there being "no standing water in Spey," although there are pools thirty feet deep. Still, as a rule, the river is shallow, having generally a depth of about three feet; and there are places which, when the water is a little low, may be crossed by a man on foot. I have seen rafts of wood coming down from the hills at the rate of ten miles an hour; and the Spey is not only the most rapid, but also the widest of our large Scottish rivers. "The cause of this is easily explained. The river drains thirteen hundred miles of mountains, many of whose bases are more than a thousand feet above the level of the sea. The Dulnain, draining the southern part of the Monagh-Lea Mountains, runs more than forty miles before entering Spey ; and the Avon, with a course as long, brings down the waters of Glenavon, which lies between the most majestic mountains in Britain. Besides these great tributaries, the Spey has the Truim, the Tromie, the Feshie, the Fiddoch, and other affluents, swelling her volume with the rapidly-descending waters of a mountainous country." The river Spey is an example of a well-managed stream, producing a very handsome revenue. It is well managed, because the Duke of Richmond fishes it himself ; and, of course, it is his interest to have it well protected, and to keep a proper stock of breeding fish. On the Spey, however, there is no confusion of upper and lower proprietors to fight against and take umbrage at each other, the river belonging mostly to one proprietor. Other Scottish rivers also yield, or did at one time yield, large annual sums in the shape of rental ; and on the larger salmon rivers of Scotland the income derived by many of the "lairds" from salmon-shots forms a very welcome addition to their land revenues. Mr. Johnstone, the lessee of the Esk fisheries at Montrose, stated at a public meeting held in Edinburgh to protest against the removal of stake-nets that he estimated the Duke of Sutherland's fisheries at X6000 a year, and quoted his own rents as £4000 per annum, giving him the privilege to fish on two different rivers, on one of which he had eight miles of water, on the other six. Princely rentals have been drawn from the salmon rivers of Scotland. The Tweed alone at one period gave to its proprietors an annual income of X20,000; but although the price of fish has greatly increased of late years, the rental of that river fell at one time to about a fifth part of that sum, and the take of fish sank from 40,000 to 4000. Much curiosity has existed as to the results achieved by the Tweed Acts, the first really stringent code enforced on any British river; and although statistics in such matters, unless taken over very extended periods, are not to be too implicitly relied on, and much allowance must be made for the variations caused by weather and unfavourable seasons during so short a period as has elapsed, yet it is well worth while to ascertain what can be learned concerning this experiment. With this view I have consulted the very valuable and interesting series of tables which has been compiled and printed for private circulation by Alexander Robertson, Esq., one of the Tweed Commissioners, and a director of the Berwick Shipping Company. A brief reference to the figures in these tables shows at once whether or not there has been an improvement in the fishing. The total capture of salmon, grilse, and trout, in Tweed for the six years preceding 1857 was 50,209 salmon, 153,515 grilse, and 294,418 trout ; making a yearly average of 8368 salmon, 25,586 grilse, and 49,069 trout. In the six years succeeding the Act - viz. 1858 to 1863 - the total capture was 60,726 salmon, 124,182 grilse, and 175,538 trout; being an average of 10,121, salmon, 20,697 grilse, and 29,256 trout. These are improving figures, taking into account that the fishing season had been curtailed by a period of four weeks. The total rent of the river in 1857 was about £5000 ; the rents during the last five years, as stated for assessment of the Tweed tax, have been as follows :-In 1868, £9224 ; 1869, £9284 ; 1870, £9598 ; 1871, £9785 ; 1872, £9945. The average wholesale prices for the same period have been Is. 5d. per pound for salmon ; Is. per pound for grilse; and Is. 214 per pound for trout. The English salmon-fisheries, generally speaking, were allowed to fall into so low a state that it will be impossible to recruit them in a moderate period of time without foreign aid. It is difficult to select an English river that will in all respects compare with the Tay, but the Severn produces the finest salmon of any of the English salmon rivers ; and it is a noble stream, containing many kinds of fish, which afford sport to the angler. If the river flowed in a direct course from its source to the sea, it would be eighty miles in length: as it is, by various windings, it flows for two hundred miles. It has many fine affluents, and in its course passes through some beautiful scenery. It rises in Wales, high up the eastern side of Plinlimmon, at a place in the moors called Maes Hafren, which gave at one time its title to the river, Hafren being its ancient name. After flowing through several counties it falls into the sea at Bristol Channel. Had the fisheries of the Severn been as free from obstacles and as well preserved as those on the river Tay, they would still have been of immense value, as it possesses some very fine breeding-grounds. The Severn could be speedily 'restored to its primary condition as one of our finest salmon streams; that is, if the various interests could be consolidated, and artificial breeding be extensively carried on for a few years. The Severn still possesses a tolerable stock of breeding-fish, which might be turned to good account in a way similar to those at Stormontfield on the Tay. Mr. Tod Stoddart, who is an authority particularly on matters relating to angling, says that a river like the Tay or the Tweed requires 15,000 pairs of breeding-fish to keep it in stock, the average weight of the breeders to be ten pounds each. Proceeding on these data, and taking the period of growth of the fish as previously stated, it may be interesting if we inquire how soon a fine river like the Severn could be made a property. Allowing that there is at present a considerable stock of breeding-fish in that river-say 10,000 pairs-and that for a period of two years these should be allowed a jubilee, the river during that time to be carefully watched; that plan alone would soon work a favourable change; but if supplemented by an extensive resort to artificial nurture and protection, in the course of three years the Severn would be, speaking roundly, a mine of fish wealth. A series of ponds capable of breeding 1,000,000 fish might, I think, be constructed for a sum of £2000 ; there ought of course to be two reception ponds, and an adult salmon pond as well, for fish about to spawn. Thus, in a year's time, half a million of well-grown smolts would be thrown into the river from the ponds, a moiety of which would in the course of ten weeks be saleable grilse ! The following year that number would be doubled, and added to the quantity naturally bred would soon stock even a larger river than the Severn. There can be no doubt of the practicability of such a scheme : what has been achieved in Ireland and at Stormontfield might surely be accomplished in England. An ample return would be obtained for the capital sunk, and in all probability a large profit besides. A recent report of the Inspectors of the English Salmon Fisheries  contains some interesting particulars of the numbers of fish taken in one or two of the English rivers. Thirty-five salmon rivers were put under question by Mr. Buckland, but replies were received from only eighteen of these. It is difficult to obtain correct statistics from net fishermen, they are so unwilling to reveal the secrets of the prison-house. The Tyne, according to the printed returns, is the best fished water, more than 129,000 fish having been captured by the nets ; the Ribble follows with over 8000 salmon, and the Severn with 6500. In all, 150,936 salmon were entered as taken from the few rivers which have answered. As to the destination of the fish taken from English waters, the returns show that they are chiefly sent to those great seats of population, London, Manchester, Liverpool, Birmingham, and Bristol. Many tons of salmon are likewise sent every year to Paris and some parts of Germany. "It will thus be seen," says Mr. Buckland, " that not only the inhabitants of London, but of all our large and populous cities, have a direct interest in the progress and development of the salmon-fisheries, as they affect the pockets of all classes of society. The flesh of the salmon is in one respect cheaper than butcher's meat, for when a joint of meat is bought, the bone is paid for, whereas in salmon there is little or no bone." Mr. Buckland makes a contribution to the economy of salmon rivers : he says-" In many rivers, I feel convinced -though it may seem a great heresy-that there are too many breeding fish, for a river may be overstocked just as a sheep-farm may be overstocked." This is an opinion that is held by several practical salmon-fishers, and it indicates a most welcome change of circumstances. Ten years ago nearly all salmon rivers were suffering from the scarcity of breeding fish, and the cry all over the country was, We are exterminating the salmon ! On this point, Mr. Buckland says-" In most cases the stock of fish is so ample that we may now venture to draw a larger dividend from our fish capital than we have heretofore, and, in any case, it is advisable to breed as many tons of salmon for the markets as possible." DELIVERIES OF SALMON AT BILLINGSGATE MARKET DURING 1872.
" Considering that the only chance of having fish in the rivers depends upon the excellence and care of the breeding-grounds at the river-heads, while the river-head proprietors, by disturbing the shingle (which should be protected) at the period of depositing and hatching the roe, could destroy all chance, and yet be legally unchallengeable, these river-head proprietors are hardly recognised as proprietors at all, which therefore should be altered. I propose that a river, from its highest breeding-ground to its mouth, and so far into the sea as private or public interests can extend, should be made a common property and a common care; improved where improvable, at the general expense of the whole proprietors along its banks; fished, not savagely, and as if extermination were a laudable object, but prudently, and with a view to permanent interests; the fish allowed to go unmolested to the breeding-grounds, at least so far as to secure a full brood, and protected against destruction in returning when unfit for food; and the expense and the profit to be divided pro rata, according to the mileage along the banks; unless, in the judgment of intelligent and equitable men, a degree of preference should be given in the case of grounds of acknowledged excellence for breeding or feeding. It may be said it would be malicious in the proprietors of breeding-grounds to consider it necessary to repair their gravel-walks with shingle from the river at the very time when depositing or hatching the roe was going on ; but could it be prevented ?-and would it be more inequitable than anticipating every fish worth catching at the mouth of the river or along their course, and allowing the proprietors of the head-waters no share?" There must of course be a limit to the productiveness of even the most prolific salmon river ; and if this be overpassed and the capital stock be broken upon, it is clear that a decrease will at once begin, and that the production must annually become weaker, till the fish are in course of time completely exterminated. Happily the prospects of our salmon-fishery proprietors never were so bright as they are at present, and as Mr. Jamieson, the intelligent fishmonger of Edinburgh, says, " it is best to let well alone."